Radio announcers always say "It's going to be a beautiful day: sunny with no clouds." I'm thinking "What's beautiful about the sun?" Give me clouds any day. My dad came over to help me with some demolition today. 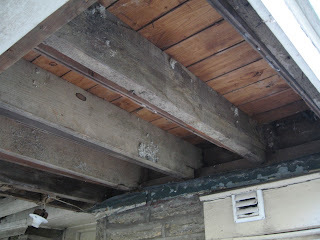 It's a long story but we'll be having some work done on the exterior of the house this year. I love the Wii. 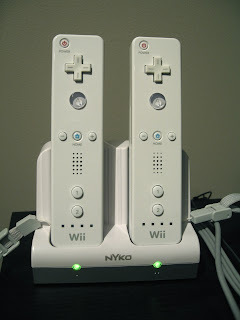 Look at my sweet Wii Remotes sitting on the new charger I got at Christmas-time last year. I wish I had more time to relax and play games. I couldn't resist. 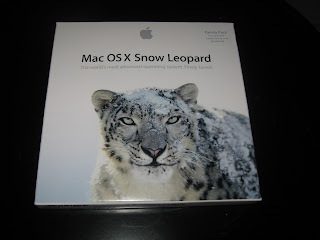 Snow Leopard came out today, so we got it. We got the family pack, which was actually very fairly priced. I am looking forward to installing it. 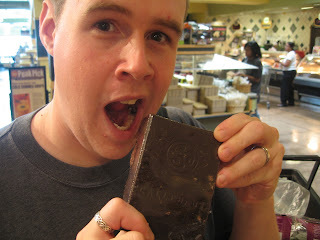 August 27, 2009: What? No Photo? Okay, this is getting ridiculous. Sometimes I think I've taken one but I really haven't. It's strange. I have some ideas for how to spice it up next year. Stay tuned. August 25, 2009: Aaaaah Cicada! 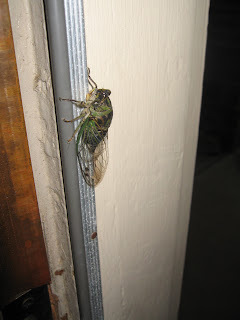 This insane cicada was sitting on the front door frame today when I went out. It scared the crap out of me. It just sat there and didn't move. Later it was gone. Creepy. 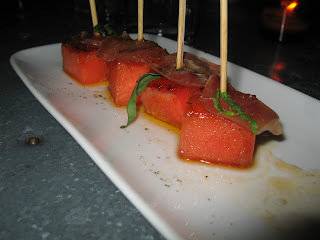 A&S came to Philly for their anniversary and they asked us to join them for dinner, so we went to Bar Ferdinand. It was quite good, but I prefer Mezze in Baltimore. I've been wanting to make a whole lemon tart for a while. 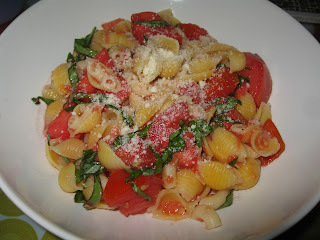 I saw it on smittenkitchen.com. 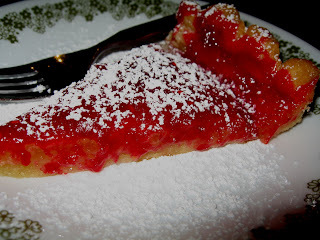 I finally decided to make it for the Golder Pie Bake-Off. This is my trial run. We had my family over tonight to celebrate Matt's, and my mom and dad's birthdays. 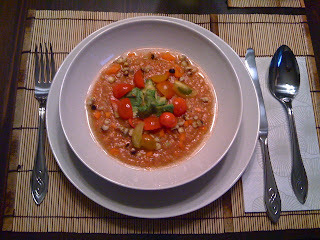 I made gazpacho and Chad made a vegetarian pasta bolognese (from Giada). Noms. 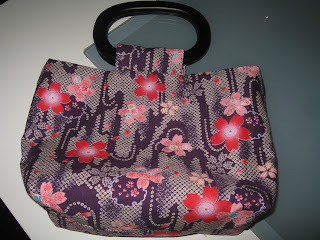 Tonight I finished the handbag project for my mom. The handle gave me a bit of trouble so I had to sew the sides shut so the handle wouldn't slip. I hope she likes it. I'm part of the way through the handbag project. 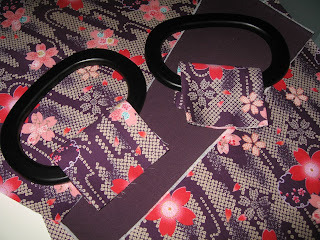 I've cut all my pieces and ironed on the interfacing. Now I just have to construct it. 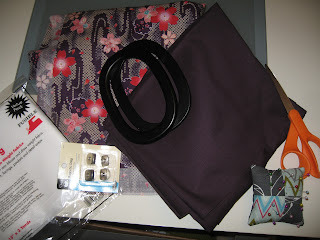 I decided to make a fat quarter handbag for my mom for her birthday using some fabric I got in Japan. Here are all the materials before I started working. 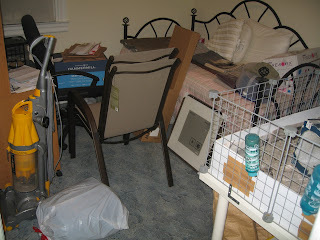 We had to clean up in a hurry one day, so all our junk got thrown in this room. It's a room that is currently used just for the guinea pigs. Hopefully soon it'll be nicer. 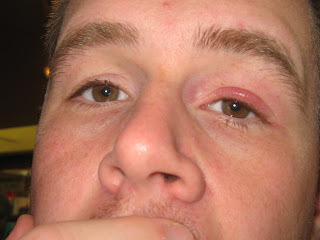 At the end of our camping trip, Chad's eye started bothering him. Look how red and swollen it is! Turns out he has clogged ducts. Lots of hot compresses. Today we had to break camp and head home. I was sad to see it over so soon. 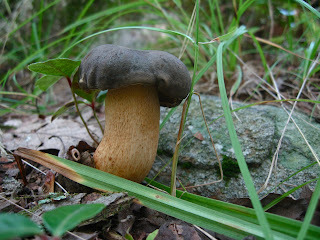 I was wandering around taking photos and found this awesome looking mushroom! 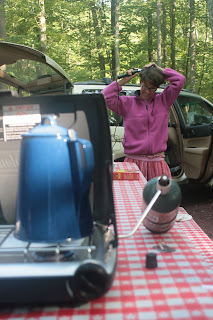 Yes we are camping, and yes that is my mom with a curling iron. She heated it up in the bathroom at the plug and then continued using it back at the site. What a nut. 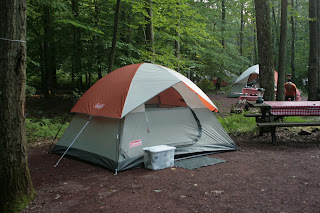 Well, we arrived at our campsite at Hickory Run State Park at about 1 PM today - Adina and Steph were already there. We got set up and then my parents arrived. Yay! We've had a LOT of rain this summer. 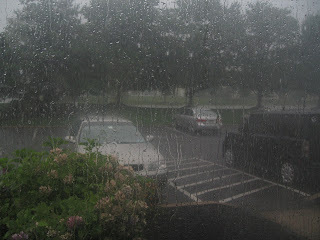 Today it was just absolutely POURING! Look at that rain! I love it. I hope it doesn't rain on our camping trip this weekend. I apologize for the horrendous quality of this photo. I took it with my iPhone. 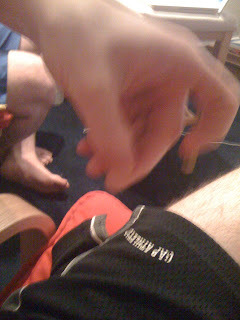 Chad was showing me how he had stabbed himself with his knitting needle. Ow. 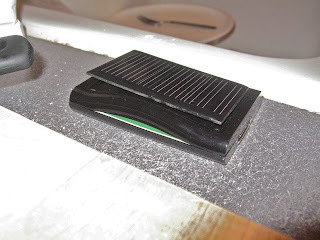 August 11, 2009: Melted Solar Charger? I got this solar charger for my iPhone. You leave it in the sun and it charges its internal battery for later use. Well, I noticed today that it had partially melted from the heat. 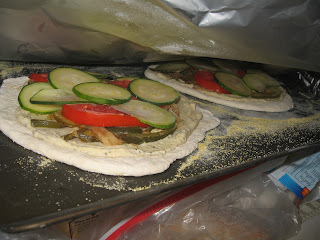 Chad decided to make this zucchini pizza, which was modified from a recipe on smittenkitchen.com. He made cashew-tofu ricotta to use and it was delicious. 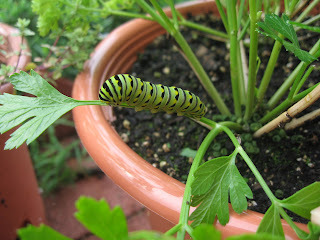 Here is a caterpillar that is hanging out on some parsley my mom is growing. It just sat there all day apparently. 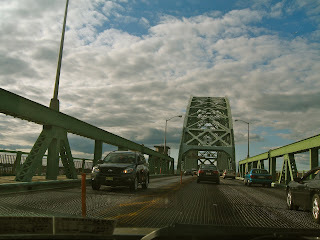 It was pretty cool-looking. I learned this trick on LifeHacker.com - put some dish soap in a bowl of vinegar. 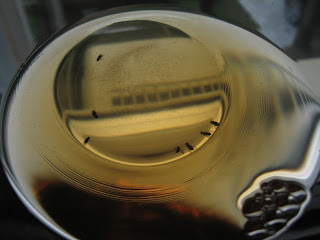 It traps fruit flies because they are attracted to the fruity smell. It's awesome. 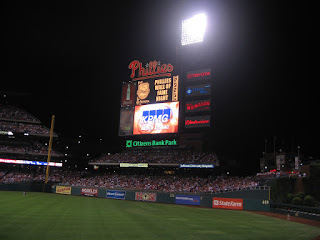 Tonight I went to the Phillies game with my dad. Unfortunately they lost, but it was an exciting game anyway. 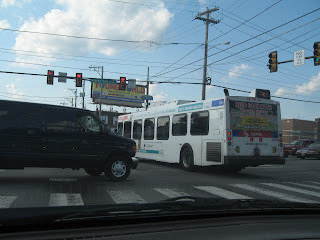 Look at this stupid Septa bus. It pulled out into the intersection when there was nowhere for it to go and the light was red. So the opposing traffic had to just wait. 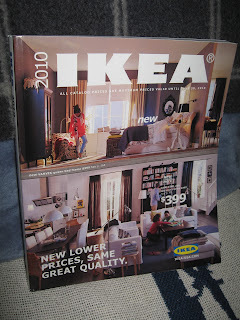 The new IKEA catalog arrived today! It's so exciting! They have dropped prices on a lot of their products and have lots more interesting things to look at, as always. Tonight was the inaugural Third Street Raveler's mix CD swap. The theme was Quintessential Now. It was a lot of fun. 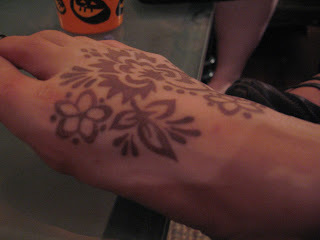 Here is Jenn's foot with her beautiful tattoo. Another day that I forgot to take a photo? There have been too many of these this year ... don't know what's wrong with me. We decided to make muesli last night. We used coconut milk yogurt which was awesome. 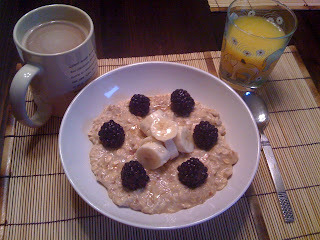 On top are berries, bananas and some honey. It was so delicious.